Duik in de antieke geschiedenis tijdens deze privérondleiding van een halve dag naar Lindos. 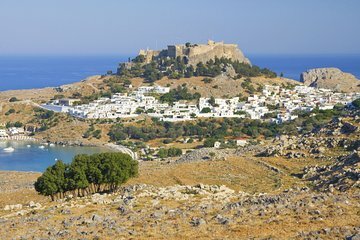 Reis langs de prachtige oostkust van Rhodos aan boord van een privévoertuig en bezoek vervolgens de 4.000 jaar oude Akropolis van Lindos met je eigen gids. Kom dicht bij indrukwekkende Byzantijnse ruïnes en bekijk de Dorische Tempel van Athena Lindia, die dateert uit 300 voor Christus. Je bezoekt ook de Hemelvaartskerk. Als er bepaalde bezienswaardigheden zijn waar u bijzonder in geïnteresseerd bent, laat uw gids weten: de reisroute voor deze privétour is volledig aanpasbaar. Entreegelden zijn niet inbegrepen. Total disappointment. This is more about the local vendor Rhodian Tours than Viator but Viator picked them. We booked this private tour because it was totally customizable. We wanted to add time to the tour so we could add a stop at the town where our grandparents were from. We understood there would be an additional cost. Two weeks before the tour we sent a detailed e-mail explaining what we were looking to do and providing contact information. These were the instructions given by Viator on how to customize the tour. Day before the tour we had not heard from anyone. We had also previously called and left a message. We finally spoke with someone at the vendors office who had no clue. Later in the day we got a call back and were told when they would pick us up and that we could go to the town we wanted to go to. When our tour guide Maria showed up her and the van smelled like smoke and she had absolutely no plan for us. When asked about the email we sent her the response was I dont read my emails. They drove us to the town we wanted to visit but we basically just drove around aimlessly. She talked constantly as if we were not even there. We then went to Lindos and essentially ran through the town because she needed to get back for another tour. There was no ability to extend the tour because she had not taken that into consideration. Our tour was 4 hours with at least 2 hours just driving around. We paid for a private customizable tour. We got a ride from our hotel to Lindos and back. Would not use them again. On the other hand Viator booked us with another tour company- Rhode Trip- for a different tour and they were fabulous. Lesson learned- ask who the local vendor is and check them out. Great guide - tremendous local knowledge and fantastic English. Went during offseason so not much happening at the village but there were no crowds and the acropolis was fascinating.